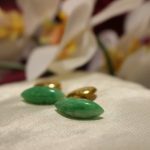 The ban on importing Burmese gemstones into the USA – namely jade, jadeite and rubies – was implemented in 2003. This was due to the USA’s stance against the corrupt military junta regime and their appalling treatment of civilians; particularly the human rights abuses of those working within and around the gemstone mines. Recently, political developments in Burma (now known as Myanmar) have seen the country return to a democratic state. This happened when Daw Aung San Suu Kyi achieved victory in Burma’s democratic elections. Most consider this political shift to signify the end of the systematic exploitation and maltreatment of Burmese citizens working within the gemstone mines and mining communities. It is this shift in the Burmese politics which has encouraged the USA to reassess its trade with Burma and reestablish the importation of Rubies and other mined gemstones into the USA. Thus, leading to the termination of the former sanctions which had been imposed on the 7th October 2016. Due to the principal of supply and demand, Burmese Ruby prices rose dramatically following the ban on trade between Burma and the USA in 2003. 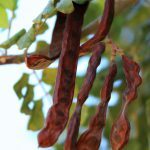 The lack of access to this product meant that buyers were willing to pay a higher price for any available example. However, this does not necessarily dictate that the lifting of the ban should mean that the prices of Burmese Rubies will decrease. 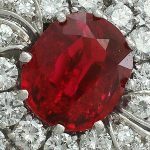 Why are Burmese Rubies Special? The reason which Burmese Rubies have been so sought after is because of the incredible vibrant fuschia color that so many of them display. This demand for vivid gemstones will not wane, and is only set to rise over time, as the luxury goods market – including gemstone jewellery – continues to see an increase in demand across all sectors. 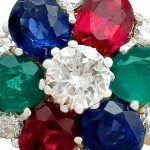 Brightly coloured gemstones continue to be in high demand with consumers, collectors and dealers alike. This means that the brilliant Burmese rubies will almost certainly continue to command large sums. Burmese rubies are the highest price-per-carat gemstone. 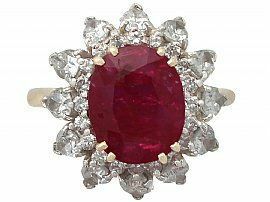 This is one of the reasons why we are so pleased to be able to offer a selection of fantastic antique and vintage Burmese Ruby jewellery! These ruby rings are stunning pieces of jewellery which benefit from the exceptional quality and colour of Burmese rubies. Due to the age of these items, we can be assured that these particular gemstones would not have been affected by the trade embargo in the first instance. Although the sanctions have now been lifted, the Burmese Ruby prevails as a highly popular and covetable stone. Furthermore, there is no forecasted price drop as these items are still relatively rare. 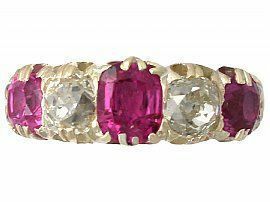 For our customers of course, this means that an item of Burmese Ruby jewellery would be a sound investment as well as a particularly bright and beautiful piece! Next Entry: Alabaster and Wilson Ltd.